It would be a mistake to assume that quartz watches were an afterthought for Rolex, even despite the company's overwhelming commitment to mechanical movements. Rolex began their own research into electronic timekeeping in the early 1950s, and was awarded their first patent for an electro-mechanical watch design in 1952. In fact, according to James Dowling in his book The Best of Time, of the 50 patents issued to Rolex between 1960 and 1990, 21 of them were for electronic watches. Rolex was even issued patents in the 70s for digital (LED) watch movements. One such movement made it all the way to the prototype stage and was issued the reference number 7065. Rolex's first commercially available quartz watch was the Quartz Date 5100. Introduced in 1970, this watch shared the Beta 21 movement used by other Swiss companies like Omega and Enicar. Rolex only produced 1000 of these watches before beginning development of their own quartz movement and the watch that would eventually become the Oysterquartz. In 1977, after five years of design, development, and testing, Rolex introduced their first completely in-house quartz movements (the 5035 and 5055) and the Datejust (5035) and Day-Date (5055) Oysterquartz models that would house them. When they were introduced, the 5035 and 5055 quartz modules were marvels of technology as well as fit and finish. These 11 jewel movements utilized the latest CMOS circuitry, a 32khz oscillator, and analog thermocompensation. In addition, they were finished to even higher standards than Rolex's mechanical movements. It is no exaggeration to say that even today, no quartz movement produced by any watch company can compare to the 5035/5055 from the standpoint of sheer beauty. For 25 years Rolex produced the Oysterquartz in Datejust models (17000 stainless steel, 17013 steel/YG, 17014 steel/WG), and Day-Date models in all gold (19018 YG, 19019 WG). Special models of the Oysterquartz were also produced with jeweled dials, bezels, and bracelets. 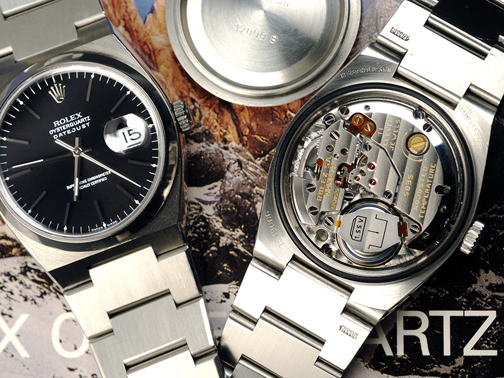 It has been estimated that in all less than 25,000 Oysterquartz watches were ever produced. The last year the Ref 17000 appeared in the Rolex catalog was 2001, and this was also the last year Rolex received any chronometer certificates for quartz movements from the COSC. This means 2001 was likely the last year any Oysterquartz watches were actually produced. The steel/gold and all gold models continued in the Rolex catalog until 2003 when the stock of these last models was finally depleted. There is clear and convincing evidence that by the time production of the 5035 and 5055 movements ceased in 2001 Rolex had two completely new quartz movements ready for use in a new generation of Oysterquartz Datejust and Day-Date watches. These movements (the 5335 and 5355) had 23 jewels and featured a perpetual calendar. For reasons known only to Rolex the decision was made not to put these new movements into production and the Oysterquartz line was finally dropped when the last watches had been shipped from Rolex in Geneva. Photo by adlibera. Used by permission. The entire contents of this website is Copyright © 2005 - 2009 by Gary M. Frazier. All rights reserved. This material may not be published, rewritten, or redistributed in any way. The copyright for photographs used from other websites remains with the respective owners and credit is given where the photographer is known. Questions or comments about this website may be directed to gmf@oysterquartz.net. Please read the FAQ page before e-mailing me your questions. The answer you seek may already be there. Oysterquartz, Datejust, Day-Date, and the Rolex coronet are registered trademarks of Rolex SA and/or Rolex Watch USA, Inc. Oysterquartz.net is not affiliated with the Rolex Watch Company in any way.